While our landscape design software includes over a thousand 3D models, you may find times when you need to create something unique. Using our new integrated modeling tools, you can now do that quickly and easily right from within our software. You can create custom models from scratch, or use any of the models included with the software as a starting point for your own designs. Since the idea of creating 3D models can be intimidating to new users, we have made the modeling tools in our landscape design software very simple and straightforward. Models are created by adding simple shapes together to create more complex shapes. For example, a house column is basically a cylinder, and a pergola is a collection of boxes that have been stretched to different lengths and sizes. Once the simple parts of an object are in place, they can be converted to a custom model for further adjusting. Once an object, or a collection of objects, are converted to a custom model, that model can be rotated, moved, given new materials, mirrored, or even edited at the point level. Modeling is a term often used to describe the creation of 3D objects, or models. These models are in turn made up of polygons. Polygons are geometric shapes, such as squares, circles, or even stars. 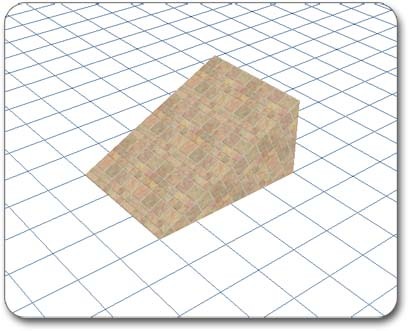 Polygons are made up of triangles, which are the most basic 3D elements. 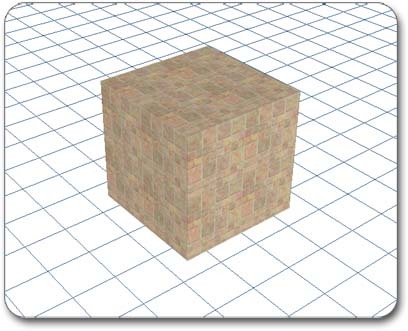 If you imagine a cube, you will see that it has six square sides. Each of these square sides is a polygon, and each square is made up of two triangles. The corners of the polygons are called points, and these corners can be moved to change the shape of the object. If you are new to 3D modeling, it may require some practice before you are able to quickly produce high quality objects. You should also try to keep the models you create at a moderately low level of complexity. While creating objects, you will notice a number to the right of the screen that indicates the amount of triangles that are in the object you have selected. For typical models, a couple thousand triangles are perfectly acceptable. However, more complex objects may reduce performance, depending on the speed of your computer and 3D video card. Under the Modeling tab, you will see several different buttons representing different shapes and functions. The first and most simple object is the box. Boxes are seen all around us, and are likely the most useful object when modeling. 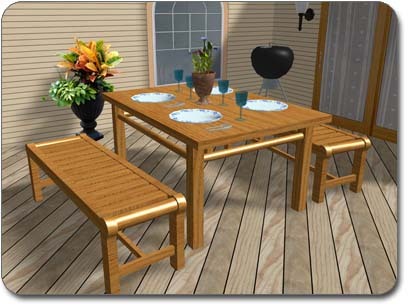 Examples of objects that would use a box are arbors, outdoor tables, and custom fences. To create a box, first click the Box button that appears when the Modeling tab is selected. Next, click on the landscape to place one corner of the box. Finally, click again on the landscape where you wish the other corner of the box to be. After the second corner is placed, the box will be created. When the box is selected, use the options at the right of the screen to modify its size and appearance. Ramps are often used in landscape designs for roofs, wheelchair ramps, swimming pool beach entries, and more. To create a ramp, first click the Ramp button that appears when the Modeling tab is selected. Next, click on the landscape to place one corner of the ramp. Finally, click again on the landscape to place the other corner of the ramp. After the second corner is placed, the ramp will be created. When the ramp is selected, there will be many options to the right of the screen that will allow you to modify its size and appearance. Cylinders are another important building block of many models. Look closely, and you'll notice that many objects in your landscape designs use cylinders. 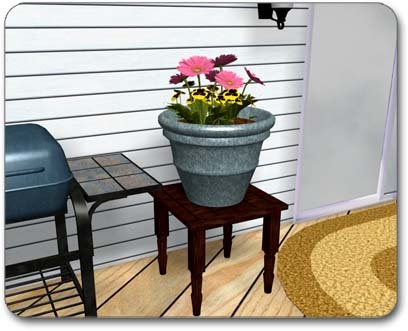 Some examples include umbrella poles, light posts, and round stepping stones. 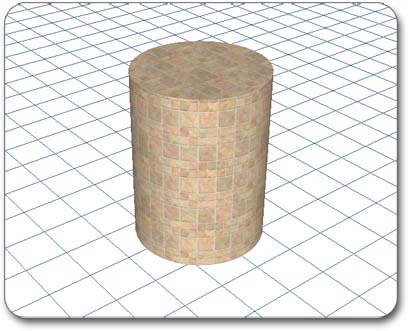 To create a cylinder, first click the Cylinder button that appears when the Modeling tab is selected. Next, click on the landscape where you wish to place the center of the cylinder. Finally, click again on the landscape where you wish to place the radius. Once the radius is placed, the cylinder will be created. When the cylinder is selected, there will be many options to the right of the screen that will allow you to modify the appearance of the cylinder. Tip: Set the top radius to 0 to create a cone. The extrusion object is a very versatile tool that allows you to project a 3D object from a 2D outline. You'll be surprised at the wide variety of objects you can create with just this tool alone. To create an extrusion, first click the Extrusion button that appears when the Modeling tab is selected. Next, click on the landscape to create your first point. Finally, continue clicking to create additional points until you place your last point over your first point. When the shape is complete, the extrusion will be created. When the extrusion is selected, there will be many options to the right of the screen that will allow you to modify the appearance of the extrusion. Tip: You can use shapes with holes to create complex extrusions. The lathe object is a very powerful and dynamic tool that creates a surface of revolution based on a line or curve that you create. For example, if you were to simply create a straight vertical line, then the lathe would appear to be a cylinder. 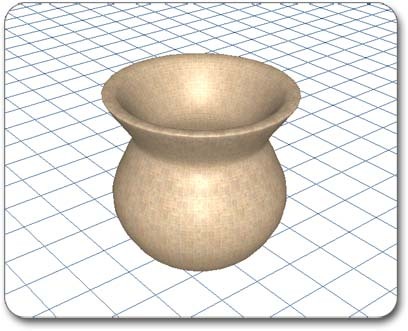 Using the Lathe tool, you can create objects such as wine glasses, planters, and vases. To create a lathe, first click the Lathe button that appears when the Modeling tab is selected. Next, click on the landscape to place your first point. Finally, continue placing points until you have completed the shape that you want to revolve. You can finish the shape by either placing the last point on top of the first point, or by right-clicking where you wish the shape to end. It is important to remember that the lathe will always be created to the left of your shape. To better understand how the lathe works, imagine a fairly complex object such as a pawn in a chess game. To create a pawn using the lathe object, you would draw the outline of the right side of the pawn. The lathe would then take that outline and rotate it 360 degrees. Parts are building blocks you can use when creating custom models. The library includes cones, spheres, cushions, boards of all sizes, and more. You can also add to your own custom parts to expand the library. To add a part, first click on the Part button that appears when the Modeling tab is selected. Next, click on the picture of the default part that appears to the upper right of the screen. Finally, select the part of your choosing from the library and place it in the design. 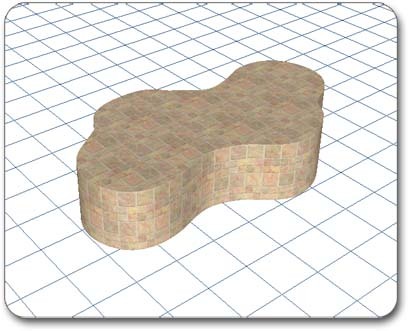 Our 3D landscape design software includes powerful tools for editing custom models. A custom model is a term used to describe a basic model that can be edited in a variety of different ways. 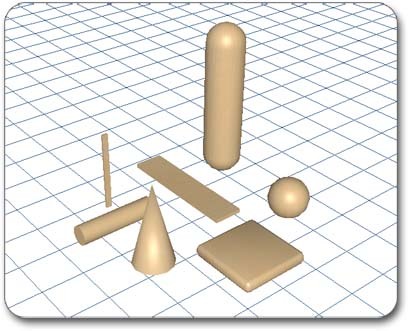 Many of the previously mentioned objects need to be converted to a custom model before they can be rotated, elevated, or edited at the point or polygon level. Unlike the other modeling buttons, the Convert to Custom Model tool is not an object that can be added, but rather a quick way to convert other objects into a custom model. 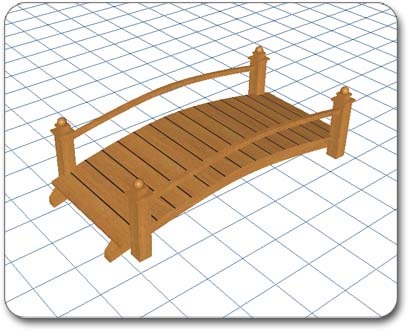 This and other custom modeling tools makes customizing your landscape designs quick and easy. To convert an object to a custom model, first select an object that has already been placed in your landscape design. Next, click the Convert to Custom Model button that appears when the Modeling tab is selected. The object will then be converted into a custom model, with all the advantages of a custom model’s versatility. It is best to only convert an object to a custom model when necessary, because some design options will be lost. For example, if you convert a house to a custom model, you will no longer be able to change the roof pitch. The main advantage of converting an object to a custom model is that you are able to rotate, stretch, and apply different materials and shaders to your model.